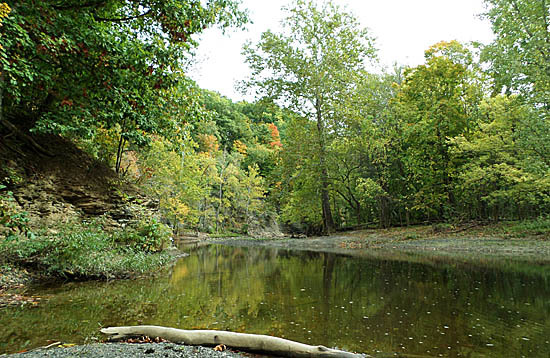 It is hard to think of a more scenic place to fish in Northeast Ohio in the fall, than the Vermilion River. While fish cooperate some days and some days they don’t, I knew I wouldn’t be disappointed taking in a nice walk along the river. Being a husband, a father of two youngsters in diapers and a gainful provider, any opportunity to fish is a blessing. While the day proved to be more of a nice workout getting in a nice hike and walk, it was very peaceful as I did not encounter another soul. The bites were few and far between, but I did land a few River Chubs and Rock Bass, species that I don’t really target or encounter all that often. In the end, at least I had coaxed a few fish into biting. The most interesting fish related happening, was spotting what surely looked to be Northern Hognose Suckers. The water was running pretty low and clear and the polarized glasses gave me a rather definitive look at the fish in shallower depths. A group of three fish had the rather distinct look of this species, a species I have never caught, so I did spend a considerable amount of time drifting baits and flies around them. I possibly had one bite, or maybe simply bumped into one, but it didn’t stay on. Not that I need another reason to want to fish this river, but I will add this to the list. Always neat to target a species that isn’t on the life list. Guess I need to read up on the species to give myself a better chance for success.